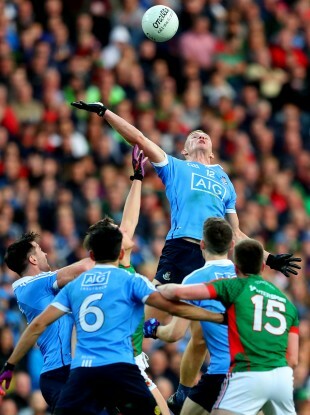 The incident that saw Ciaran Kilkenny concede a free in Saturday's clash between Dublin and Mayo. BEFORE PLAYING FOR Dublin in Saturday’s All-Ireland replay, Ciaran Kilkenny sat down to watch another major sporting final on TV. Kilkenny had a brief Aussie Rules career with Hawthorn before deciding to return home in January 2013. On Saturday morning, he watched the AFL Grand Final as the Western Bulldogs ended a 62-year wait for glory with a victory over the Sydney Swans. The problem was when the 23 year-old went to play in Croke Park later that day, thoughts of Aussie Rules were still swirling around in his mind. In the 64th minute, referee Maurice Deegan threw the ball up between Dublin’s Michael Darragh MacAuley and Mayo’s Barry Moran. Before the ball landed, Kilkenny had rushed in and fisted it away in mid-air. He was penalised for being the third man in by Deegan and Cillian O’Connor slotted the resultant free to leave Mayo adrift 1-14 to 1-13. Annoyed with himself for his mistake, Kilkenny resolved to get involved in the finale and went searching for possession off Stephen Cluxton’s kickouts. “I suppose it’s experience. I was watching a bit of AFL this morning, the Western Bulldogs were playing the Sydney Swans. “When they do the ruck and when they throw the ball up a third man is allowed to come in and hit it if he wants. “So I went in and I did that but Maurice Deegan gave a free against me. So all I was thinking was I need to get a kick out, I need to get on the ball and kill the game and try and make up for it. Kilkenny certainly stepped up for Dublin, helping to close out the game and influencing the exchanges like he has throughout this summer. “It’s a special feeling I can’t get it into words. There was a special aura all around the team this year we are all brothers and we are all family. “We are all so committed to it we give so much time to it outside of training. We go to the sea together, we go for food together. So it’s so special to win with this group of players who love spending time with each other, we nearly miss each other now in the off season. Despite an exhausting schedule, Kilkenny is determined to savour the celebrations of Dublin’s latest success. “You’re giving absolutely everyone for 160 minutes there. You’re going to ice baths and you’re getting a massage, every part of your body hurts and you’re only recovering the following weekend. Email “Watching Aussie Rules got inside Ciaran Kilkenny's head during the All-Ireland final”. Feedback on “Watching Aussie Rules got inside Ciaran Kilkenny's head during the All-Ireland final”.